Fender Champion 600 as "practice version of my full-size amp"? Discussion in 'Amps and Cabs' started by Benjam226, Feb 12, 2012. I use one as a practice amp. I don't run too many pedals into it very often, but if you put a smooth OD into it w/ a compressor and some reverb, it sounds pretty good. I put a USA 12ax7 into it, and it definitely improved its tone too. There are also mods you can do to it too, but I've never bothered. They're really fun! I have one sitting on my desk in my office (work from home). If I'm having a rough day it's all like, "HAY, play me!" and I'm all like, "Okay!" Didn't bother modding it. That's not why I bought it. Great home practice amp, especially for players who use pedals. Makes a great recording amp as well. I use the Champ 600 as mini-version of my rig. I even have very similar pedalboards for my house and studio. I kinda cheat though. My 600 has the Mercury Magnetics mod and I even pulled the chasis out and put it in a larger cab with a 1x12. It doesn't really sound that much like my Matamp but I can fake it. I got one for less than $50 from GC. Stock, I think it sounds crappy. At bare minimum, you should put decent tubes in & rip out the grill cloth. It's a loin cloth material that really dampens the speaker (which actually doesn't sound bad after that). I ended up ripping out the guts & put in a 5C1 circuit along with a new Weber. Much better now. New tubes & grill cloth completely change this amp. My buzzed a good bit, by the time I bought the amp, added a 8" weber speaker, mod kit from ebay, new grill cloth and new tubes. Had about $300 in the amp. It does sound good now, but if I had it to do over again I would just buy a better amp. Use my 80s super champ more anyway to practice. I don't think out of the box they are great amps. Better stuff to be had for used once you factor in a few changes. Plus, 6" speakers are not the most useful size. Great amps. Great for learning how tube amps work when cranked as well. Normally they are too loud for diming and using for practice, however, here is a trick I found that makes it into a practice volume amp, totally cranked, and useable as a mic>PA type amp. 1. Get a chair with a padded seat cushion, and/or fold up a towel to create cushion on a chair. 2. Place the amp grille-cloth face down on the cushion/towel. 3. Plug straight in and dime the amp. You should find that the weight of the amp bearing down on the padding naturally attenuates the sound without coupling it into the floor and without substantially affecting the tone of the amp. The back port provides the 'cranked amp' sound at appropriate volume levels. You can point a mic at the port just like you would a normal speaker, but you need to mount it vertically. If you find it's a touch too dirty for your tastes, it's very easy just to replace the 12AX7 with a lower gain preamp valve. You can then use the volume knob on your guitar to control gain levels and really experience a cranked amp sound at manageable levels. I have one. Out of the box, they are OK but not great. 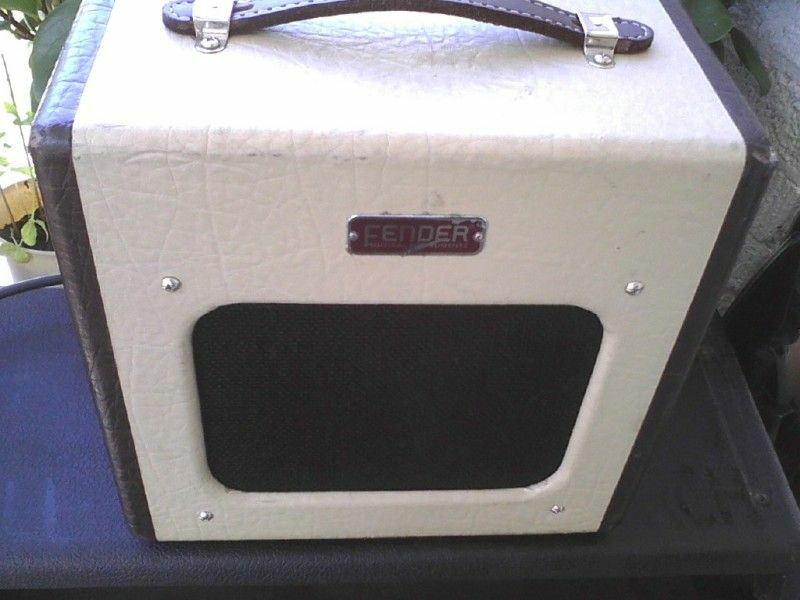 Un-modded, a used Cube 15 or 30 is twice the amp. But I did the following mods and now it is a great little single-ended banger of an amp. installed a Weber sig 8" -I had to cut a new baffle board out of 3/8" plywood but the new speaker really opens this amp up. You can get a weber 6" if you don't want to cut a new baffle. If you do opt for the 8", do the grill cloth after as the size changes (duh). These mods cost about $40-70 if you do them yourself. This advice below with one one important change. Just sit the amp face down beside you on the couch. My favourite practice amp move in the world. You get a more manageable volume, a great tone out of the back, and the amp vibrates the cushions beneath you making it feel like you're actually playing a bigger amp and better connecting you to your music.